Make of a new type of turbines that can all run uniformly in series along a single uniform penstock pipe (a uniform running water column) is cheaper, easier, safer, more efficient and more durable than turbines in use at present. So, please contact me in the above address for manufacturing with 'Patent Right'. You need to know basic science related to climate. 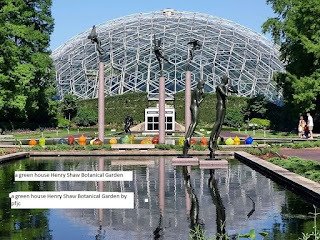 They are rain cycle (functions, key factor - lifting up humid air to the height where it can condense to droplets, heated land surface not evaporation from sea surface etc, the most effective cooling system of nature) fluid property, green house, green house effect, trapping heat, 3 methods of heat transmission, physical properties of climatic atmosphere (stratosphere) etc. If you know them, you will have no problem to realize that GHE due to gases is impossible and that GHG idea is fake or metaphorical. The CREATOR has not made gases for GHE to warm the earth. They are great coolant of one of many cooling systems of the nature. Gases are freely moving molecules. So, they can’t form ‘green house’. Only solid materials can be fixed to make four walls. 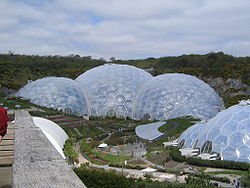 Solid transparent materials like plastics and glasses are used to make green houses, so that the sunlight goes though to heat inside the green houses. So GHG idea is not analogy but metaphorical, ridiculous, fake, imaginary, spurious and greatest fraud in the history of science. Gases are helping the earth to cool down by convection method of heat transmission all the time and man has no control over the process. Therefore, don’t blame gases for GHE. We can reduce the use of fossil fuel to almost zero percent for electricity by making correction in the hydropower engineering. (Details in the following post include- Part I about climate science with explanation of the cause of Climate Change and Part II – solution to Power Crisis ). CC or GW due to gases is ridiculous. gases are helping the earth to cool down by convection method of heat transmission. Part I CC due to gases is impossible and Part II solution to power crisis. I. I. CLIMATE SCIENCE Key factor in climate system of Nature is Rain cycle, not gases. The best mitigation due to CC is to stop it or control it. We can control climate or present climate change is reversible. (B3) CLIMATE CHANGE, ENERGY, WATER AND FOOD PROBLEMS CAN BE SOLVED SIMULTANEOUSLY and almost immediately. WE DON'T NEED FOSSIL FUEL OR BUCLEAR FOR ELECTRICITY. WE HAVE UNLIMITED HYDROPOWER AND WIND POWER. CC IS MANMADE BUT NOT DUE TO GASES. Gases are not manmade. Urbanization, deforestation, dry land expansion and deserts expansion etc. are manmade. DRIER the land surface, the hotter it is and more it is moist, the cooler it is. Thus, the atmosphere is cooler or hotter depends how much of the land surface is moist or dry. Updated from time to time, the following list includes only the established known science and facts. No point is my opinion or assumption as GHG / GHE due to gases is imaginary. So if anybody could find any point wrong, I will be very much thankful. Hereby, I also request to state meaningful science instead of meaningless comments. A. GHG / GHE idea is ridiculous fake science. Worst, disgusting, embarrassing fraud in the history of science. 1. Green house. It requires solid transparent materials to form a green house. 2. GASES are freely moving molecules. 3. Gases can't form green house. 4. They can't be fixed to make walls / roof of a structure like 'green house'. 5. All matter / gases in Nature can hold Heat, so they can absorb heat like any gas e.g. CO2. 6. Convection method of heat transmission. Heat is always transmitted from higher to lower temperature. 7. O2 is 700 (21/.03) times more than CO2. Corrected to be exact 553 (21/.038) Thanks to Rafikiy. 8. N2 is 2600 times more than CO2. Corrected to be exact 2053 (78/.038) Thanks to Rafikiy. 9. CO2 is not a pollutant. We carry the gas in our blood since birth and live throughout the life with the gas. 10. Plants use the gas to prepare food. Then, HOW CAN THE GAS BE A POLLUTANT? 11. If GW were due to 'green house effect" (GHE), the upper layer of the Troposphere (our climatic atmosphere) should be warmer than the flat land areas because warm air goes up. So the top of the MT. Everest should be hot zone. The earth would have never been colder than the beginning 4 billion years ago. 12. Our atmosphere is not closed like a green house but open to space. 14. It wouldn't be cold during night (after the sun set and before the sun rise). 15. Minimum temperature is recorded about half an hour earlier than the sun rise. 16. We know it is always colder during night than during sunny days. 18. Materials become opaque when they reflect light. 19. Every molecule radiates absorbed heat when the surrounding is colder. It absorbs heat when the surrounding is hotter. All objects at a place try to equalize temperature. 20. Foggy, smoggy, and cloudy days are colder than bright sunny days. 21. Gases are not layered in the Troposphere; it is a homogenous mixture of gases. If it were layered the heaviest gas, CO2 would be at the bottom not on top. Then animals wouldn't survive. We need O2 to be alive. 22. Gases of atmosphere should be still (no breeze, no wind) to be layered. Breezes, winds, hurricane, tornadoes, convection current or any motion thoroughly mixes all the gases. 23. Molecules of fluids move upwards when heated and downwards when cooled – the convection current. 24. CO2 is transparent, colorless, odorless, and heaviest gas of the atmosphere. It does not make shadow as clouds do. 25. If something does not allow going out means does not allow getting in as well. GHE applies only with the solid transparent materials like glasses and plastics not for the fluids (gases and liquids). 26. Methane is negligible, only traces. 27. Insulation traps heat partly. Gases alone can't trap heat. Gases can't work as an insulator in the open space. Our atmosphere is not insulating the earth. it should be air tight for effective insulation. The clothes we put on, the four walls and roofs etc. work as insulator, lesser the passage for air to pass through in and out the more effective is the insulation. # Physical properties of fluids (gases and liquids) and atmosphere don't support them on GHG idea at all scientifically. GHG / GHE idea is metaphorical/ fake. B.1 Causes of CC (Just because you (NASA and IPCC) did not know or could not explain the cause of CC you are creating fake, imaginary, false, spurious and so on science to mislead the world. GW is not the problem but water. Here is the explanation for the cause of the CC. I challenge all the scientific institutions / organizations especially NASA and IPCC that support GHG / GHE idea to prove my scientific analysis is wrong. CC due to gases is impossible instead they are helping the earth to cool down by convection method of heat transmission.) So they don't have proofs. My Scientific analysis is 100% proof. So gases are not responsible for global warming but cooling the earth. B2. Mistaken Reason for CC - The main reason for global warming is due to the mistake done by human being for explaining the rain cycle wrong way that it occurs by the evaporation of the sea water. If it were so, now-a-days we should have rains more often than in the old days – global warming and expansion of the sea surface, both are favorable for evaporation needed for rain cycle. Sea surface temperature (average 15C) is not hot enough to lift water vapour to form cloud needed for the rain cycle. If that is possible we will have rains all the time, (even during winter we have that temperature in Nepal on the average). Water vapour evaporated from the sea surface must come over land to get lifted as the land surface gets heated by the sun and air moves upward as air current. We are making more and more land areas drier and drier by urbanization - covering land by concretes, black top roads, deforestation, and expanding deserts. So evaporation from the land areas is decreasing, as a result cooling of the land areas is decreasing significantly. Land areas are hotter than sea surface temperature. B3. We can control climate or present climate change is reversible - Just by determining how much land surface area of the earth to keep moist. More the land surface moist, the more is rain cycle and cooler earth surface. I shall be grateful to you if you could go through my blog for details and share with your friends. C. Ozone depletion is not possible Ozone as such can't exist as a layer. It is extremely unstable and heavier than O2. It breaks into oxygen atoms as soon as it forms (if not kept pressurized in a closed container).It is formed when oxygen molecules breaks into atoms with heat of high temperature (UV). Stratosphere is tremendously cold zone and extremely low pressure. Ozone formed breaks down into oxygen atoms as soon as it forms and releases heat. Even at sea level at NTP ozone is unstable. So ozone layer exists only in theory. Intermittently forming of ozone will continue until the oxygen is in the atmosphere and we receive UV from the sun. So ozone depletion is not possible. Ozone formation is a step to return heat back to space. It is not ozone that blocks heat but O2 and in the process O3 is formed to release the heat absorbed by O2. D. Don't blame CFC (too scarce and too heavy to reach the stratosphere) for thinning stratosphere. In reality, Millions of jet flights everyday are consuming too much of oxygen of the layer. Copy my list, go to NASA / IPCC and tell them about my challenge. Or, at least talk to your elementary sc. teacher to find out true sc. I will reward you for your efforts. Thus Present CC is reversible and we can control climate. Make of a new type of turbines that can all run uniformly in series along a single uniform pen stock pipe (a uniform running water column) is cheaper, easier, safer, more efficient and more durable than turbines in use at present. 1. It is possible to uniformly run turbines in series. A uniform flowing water column can evenly run any number of turbines that are made appropriately and are installed by series principle in between its intake and discharge points. Because water continues flowing consistently even after rotating turbines with the same velocity, there is no change in the flow of water before and after turning turbines; it means turbines don’t decrease the power of running water. And, because water flows down due to the pulling force of Gravity which is a constant factor, no matter how much mass we drop, the power of steadily running water also remains constant. In accordance with Pascal Law (Hydraulic Press), Multiple Pulleys and First Class Lever to lift loads; and Falling Bodies, any number of turbines installed by series principle can uniformly run along a single flowing water column (Pen stock Pipe). Water flows with uniform velocity throughout running water column. So, there is no change in the rate of discharged water before and after running turbines. That means running turbines don’t decrease the power of flowing water column. That is because Force of Gravity runs water. G-force is a constant factor at a given point, no matter how much falling bodies are involved. The force of gravity can’t be reduced, nor blocked, nor shifted from a given point. So, at present we are tapping only minimum HP in wrong way. BLUNDER IN HYDROPOWER ENGINEERING: CORRECTION MEANS END OF POWER CRISIS. Turbines in practice at present are not made for series installation. They need modification so that they can be installed by applying series principle. If we make correction of the mistake there has been on hydropower engineering we wouldn't need any other sources of power at all. The cleanliest power will be available by cheapest possible way we can think of. Please avoid the most dangerous power source. At present we are tapping only minimum hydropower by applying the principle of still water column that it exerts highest pressure at the bottom, so we run only one turbine at the bottom of the running water column. The property applies in standing still water column only . It is a blunder in hydropower engineering. In hydropower we have the running water condition. The pressure effect in a running water column is uniform through out, from intake to discharge points. Considering the properties of uniformly running water column, it is possible to run many turbines in series along a single uniform penstock pipe. We have to keep water running consistently to maintain constant revolution of the turbines. Uniformly running water column has uniform velocity and pressure throughout, from intake to the discharge points (Bernoulli Theory). So we can install turbines at any position of the running water column. And, by maintaining uniformity of the water column before, through and after the installed turbine, the velocity of the water column can be maintained constant. Turbines rotate with the same velocity as running water column. 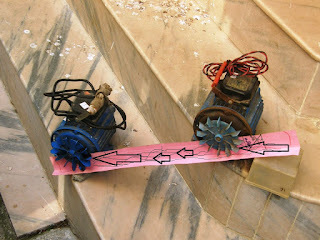 So there is no change in the velocity of water after running a turbine(s). Therefore the turbines don't decrease the power of running water. So we can install as many turbines in series along a single uniform penstock pipe as space allows. Application of the properties of uniformly running water column can open the door for unlimited hydropower. Only limitation is the space required for placing turbines. 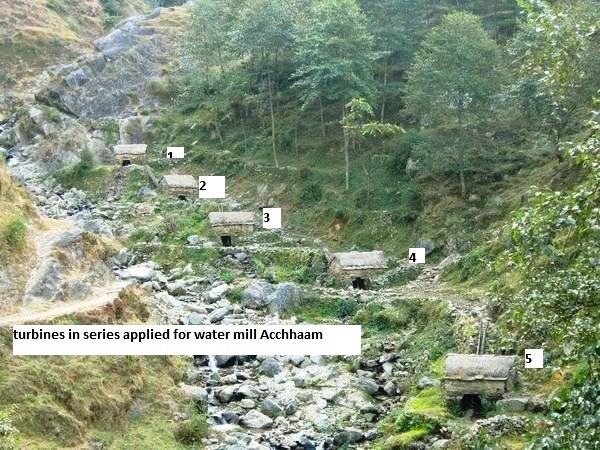 This method not only can end the power crisis but will also help to reverse the present climate change as the power will be available to pump water from rivers as much as we need to keep the land surface always moist, recharge ground water, boost rain cycle and eventually reduce sea level rise. So we must consider the principle of running water column for installing turbines. Applying the property of standing still water column to a running water condition has been a blunder in hydropower engineering. Considering the fluid properties of water (pressure is exerted equally in all direction) and the nature of gravitational force (at a given point never reduced nor blocked nor shifted) multiple turbines can be installed in series along only one water running pipe. The turbines don’t decrease the power of running water, because the turbine rotates with the same velocity as the running water. 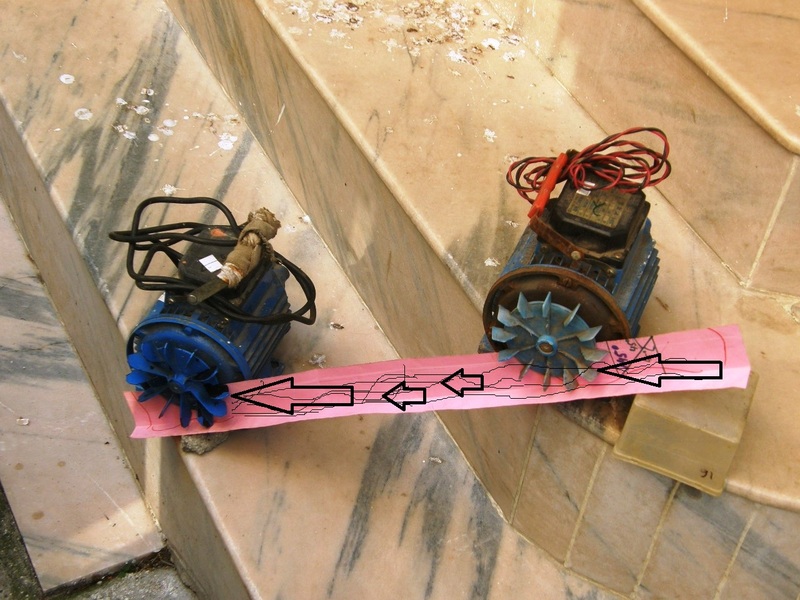 DEMONSTRATION Water meter is a good example of miniature turbine. Many water meters can be connected along the same UNIFORM water supplying pipe in series and run all of them uniformly. THUS IT IS POSSIBLE TO HARNESS many folds (limitless) more hydropower than done by present practice. Engineering works has to be developed differently so that the running water column is uniform before the turbine, inside the turbine and after the turbine. Hydro power can be installed without reservoir / by runoff type, but making lakes as much as possible will hold water in and on land - will be eco friendly, cool climate, aquatic life, lower sea level rise, water sports, transports, greenery, enhance rain cycle, make water easily available in the nooks and corners etc. From the reservoirs we can install turbines as run off type water supply. 1. OZONE depletion by CFC (Cl2F2C - dichloro-difluoro-carbon) is impossible, because it is too scarce and too heavy to reach to the ozonosphere. 2. Considering the action of UV, the depletion of Ozone is not possible before the extinction of human race (we need at least 16% O2 in the atmosphere to survive). UV is constantly forming O­3 (Ozone) out of the Oxygen of the atmosphere, thus reducing the amount of UV reaching the earth and is constantly making up the ozonosphere consumed by millions of jet flights every day. After extinction of human race, vegetation will be denser and thus O2 will be released into atmosphere at higher rate than at present. Thus, O3 depletion is impossible. Fluctuation momentarily is not depletion. At NTP (Normal Temperature Pressure) ozone is unstable, breaks into oxygen. Ozone needs high temperature and or high pressure to remain as ozone. It comes in a closed bottle. 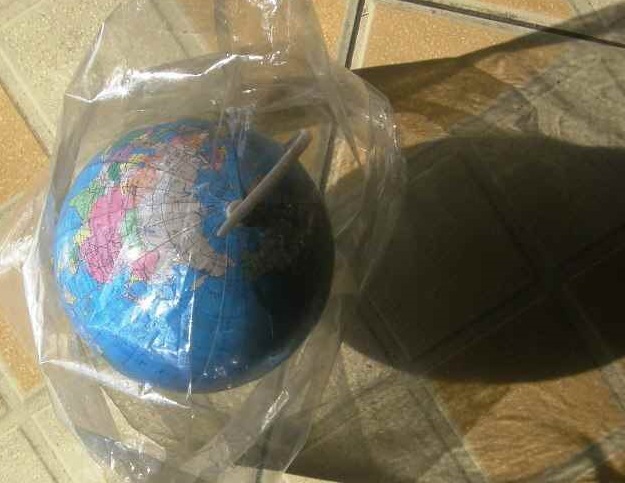 Ozonosphere exists because of very hot UV from the sun. The UV combines oxygen atoms to form ozone. But ozonosphere has very low pressure and temperature so can’t stay as ozone and breaks into oxygen and release heat it absorbed from UV, but as soon as oxygen is formed intense heat of UV again converts oxygen into ozone. So ozone does not need anything else to break down into oxygen at NTP. This make and break between oxygen and ozone is going on very fast, in no time. So Ozone is formed as a step in the process of releasing heat absorbed by O2, so O2 absorbs heat not by Ozone. More correct to say that so called Ozone layer is actually O2 layer. We have been talking about ozone depletion since we noticed the global warming and climate change. And, we have been accusing CFC for the depletion. But scientifically it seems ozone depletion is not possible since nature is forming ozone from oxygen all the time with the help of uninterrupted Ultra Violet rays (UV) received from the Sun. Our immediate climatic atmosphere (troposphere) IS NOT LAYERED. It is a homogenous mixture of gases because it is moving all the time, and is thoroughly mixed up. So there is no layer of gases that reflects heat because gases move upwards when it is heated. It releases heat when it reaches a colder zone. Above climatic atmosphere is so called Ozonosphere. We all know the air becomes thinner as we go higher. So lighter gases are situated at higher altitude and heavier gases are situated near the earth due to the gravitational pull of the earth. So the troposphere has all the heavy gases. Compared to the atmosphere near the surface of the earth the so called ozone layer is very thin. This we can guess by considering the fact that the mountaineers have to carry oxygen with them even to climb mountains that are much lower than Mount Everest. Ozone is situated even at higher altitude, 30,000 feet. So naturally ozone layer must be thinner than oxygen available at the height of the Mount Everest. CFC is dichloro-difluoro-carbon, Cl2Fl2O. It has two atoms of chlorine, two atoms of fluorine and one atom of carbon. Carbon dioxide is CO2; it has one atom of carbon and two atoms of oxygen. Ozone is O3 or three atoms of Oxygen and it is very unstable and reactive, and breaks into oxygen as soon as it forms. Molecular weights of O2, CO2 and CFC (comparative weights, Hydrogen is lightest gas so its weight is considered 1) can be calculated as follows. (Oxygen 16X2 =32, CO2 12 + 16X2 = 44, cl2 fl2 c (CFC) = 35.5X2 + 19X2 + 12 = 121, Ozone (O3) = 16X3 = 48 and atomic oxygen is 16; that’s why ozone as a layer can't stay at higher than our immediate atmosphere. Thus, so called ozonosphere is more correctly O2 layer. 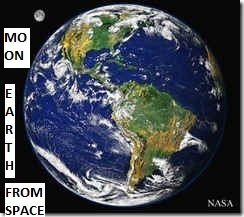 Concentration of CO2 in the so called ozonosphere is nil as this gas is heavier than O2. So CFC molecules are too heavy and too scarce to reach to that height, then how it can deplete without being in contact with ozone? CFC is very heavy compared to CO2 and oxygen. It can’t reach to the ozone layer. Because the heat of the Ultraviolet ray from the Sun is available uninterrupted, oxygen molecules are broken into atomic oxygen and atomic oxygen cannot stay alone, it has to be in the molecular form by combining with other atoms and forms ozone, O3 which is very unstable and reactive and forms oxygen molecules, O2. Molecules of oxygen by absorbing heat of the UV from the Sun form O3 and are again broken immediately into atomic oxygen forming stable O2. Since only oxygen is available in the so called ozonosphere, UV combines with other atoms of oxygen and again becomes ozone. the process goes on and on. this process is happening in our climatic atmosphere, troposphere as well. Ozone by breaking into atomic oxygen releases heat it absorbed from UV to form oxygen molecules, but as soon as it becomes oxygen molecules UV breaks them to form atomic oxygen by the continuously available Ultraviolet rays from the Sun. Again the ozone molecules break into atoms of oxygen immediately and releases heat. This is how ozone releases heat and sends some heat from the Sun back to the space. This ‘make and break’ of ozone goes on in no time, all the time. Thus it is not ozone that absorbs heat of UV but Oxygen. The sun’s rays are always entering the earth’s atmosphere. Fluctuation of Ozone formation is cyclic - during October to January it is low (because sun shines on the southern hemisphere where vegetation is low) and high during February to September when the sun shines on the Northern Hemisphere where vegetation is high; plants release O2 during photosynthesis, so O3 formation is higher during February to September. Banning the jet planes to fly higher than 25,000 feet will definitely save our Ozone layer. But it is not necessary because uninterrupted UV from the Sun is continuously forming ozone out of the oxygen of the atmosphere, by doing so UV entering into our atmosphere is reduced to a great extent. Flowing water can uniformly and independently run any number of turbines installed in series along a single uniform penstock pipe without decreasing their efficiency, because pressure is transmitted equally in all directions. Thus EARTH IS BLESSED WITH unlimited hydropower. Turbines don’t decrease the power of running water as it continues with the same velocity. At present we run only one turbine at the bottom of a running water column by applying property of standing still water column, it is a blunder in hydropower engineering, so are harnessing only minimum hydropower. Application of running water properties in installing turbines means WE CAN TAP many folds more HYDROPOWER (AS MUCH AS WE WANT OUT OF AVAILABLE UNLIMITED HYDROPOWER) than done at present from the existing installations – only limitation is the space needed to extend the pipe for installing turbines. CLIMATE CHANGE DUE TO GASES IS IMPOSSIBLE. TThe moisture conditions of the earth’s surface wet or dry, not gases, determine or control the climate/weather. 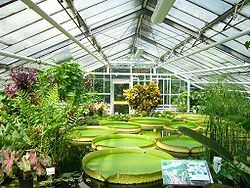 Gases can’t form a green house, so Green house effect due to gases is imaginary or pseudo science. Rain cycle is related to heat and evaporation only. Thus C.C. change due to gases is impossible. TO END THE POWER CRISIS AND CLIMATE CHANGE FROM THE WORLD. DRAFT: please excuse me about my English, needs extensive editing. Extinction is explained wrong way! In the first post above, I have proved scientifically that the GHG idea is fake. CC is real but not due to gases and can’t be so. CC due to gases is impossible. Here in this post I am trying to explain scientifically about science (topics can be found in the history of earth) of extinction which is claimed unscientifically is due to asteroid hit and other speculations and assumptions. At the time when dinosaurs became extinct, the atmosphere did not support burning. O2 level was below the percentage required for burning (15%). Slow combustion is possible when the Oxygen 10% but burning into flame or catch fire we need at least 15% or above. When dinosaurs appeared O2 in the atmosphere was 10% and when became extinct it was 15%. Dinosaurs were warm-blooded though they were reptiles. But they could not stand O2 more than 15% in the atmosphere; then new species of animals – true warm blooded, the avian appeared. GHG idea is dangerous leading to extinction of all warm blooded animals. If we stop burning (making fire – slow combustion or into flames) will increase O2 in our atmosphere very rapidly. This will make birds or avian to disappear first. They have highest temperature and they were the first to appear as the true warm blooded animals. Dinosaurs as reptiles were also warm blooded. Birds appeared after or at the time dinosaurs became extinct. I am sure the body temperature of the birds at that time was much lower than it is at present. The O2 level in the atmosphere at that time was just about 15%; and it is raised to the present level nearly 21% about 200,000 years ago when first present human being (Homo sapiens) appeared on Earth. The body temperature of the birds must have increased because we know higher the O2 concentration level, the burning is faster thus raise temperature. Our predecessors like Neanderthal, Homo-erectus etc must have had lower body temperature because in those days O2 level in the atmosphere was much less than 19%. We can tolerate body temperature up to a certain limit thus certain level of O2. We know we can’t stand when our body temperature is more than 105F or 40C as Fever. Scientists seem to agree most suitable O2 concentration for us is between 19% to 23%. So in order to control O2 we must burn or make fire or we must control producing O2; that means we must have balance between burning and producing O2 (by photosynthesis mainly). Thus burning is essential (a must) to keep O2 level at present level. We are consuming O2 and all other animals mainly. If we want to save fossil fuels we must burn dry plants in any form to keep O2 level controlled. Compared to 200,000 years ago, burning at present is tremendously increased especially by burning of fossil fuels, by respiration of increased population humans, livestock etc but O2 level is not decreased (thus CO2 can’t have increased); but may be O2 is on the increased because of the photosynthesis. So we must keep O2 in balance to survive longer – but eventually Humans including all warm blooded animals will be extinct when O2 level is less than essential or more than we can tolerate. O2 supports life within a limit – scientists seem to agree that 19 to 23% of O2 in the atmosphere is most suitable for us. Less than 10% is deadly we know but by how much more than we can tolerate (?) because more the O2 level is raised higher, the body temperature of our body will also be raised. Dinosaur Era Had 5 Times Today's CO2.